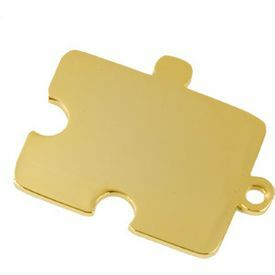 This Asymmetrical Puzzle Piece Pendant is a larger gold plated pendant which makes a great necklace to show your support for Autism. Measuring 1.25 x 1.5 inches, these bold pendants are perfect for wearing to make a statement about what matters to you. Each pendant weighs 3.5 oz. The asymmetrical pattern features 2 'innie' tabs and one 'outie' tab in addition to the 'outie' tab that is for the link. Make sure to check out all our Autism Awareness products!